Greensburg, KS (June 22, 2018) – Being a single mother can be tough. But according to the American Psychological Association*, it’s even more difficult than you may think. That’s because households led by a single mom have a 31.6% poverty rate. So, it’s important to give single mothers better options for supporting their families. For Tami Raber, Digital Works was the key to her success. Raber is a single mom with a 17-year-old daughter living in Greensburg, Kansas. Greensburg is a small, rural farming town in central Kansas where, due to its size and location, there are limited jobs. Tami Raber working hard at her new insurance job. In early 2018, the Youth Core Ministries program introduced her to Digital Works. Youth Core Ministries utilizes the circles model by addressing poverty and providing real long term solutions. They teamed up with Digital Works to help educate and find IT jobs for people living below the poverty line in rural areas. Raber was given the opportunity to complete the program ‘virtually’. 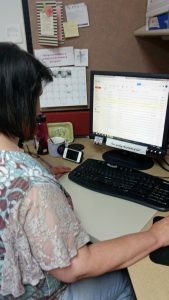 She met with her class facilitator Tammy Spring, and mentors Cathy McFall and Deborah Factor, three days a week via webinar to review the training mods and complete the necessary exercises and quizzes. Raber used what she learned in Digital Works to help bump up her income so she could provide a better life for herself and her daughter without being forced to leave her family and the home she loves. After graduation, Raber received a job offer from LiveOps assisting one of the top auto insurance companies in the U.S. In fact, Raber actually recommended this program to two friends who were in similar situations to hers before Digital Works. One was working at a store in town and not making a comfortable amount of money, the other was a friend’s daughter who was considering different careers. Raber told them how the experience helped her and how it could do the same for them. To bring Digital Works to your community or to find out details on our latest classes, head to digitalworksjobs.com.